Callahan & Blaine is “California’s Premier Litigation Firm.” Callahan & Blaine is a 25 attorney litigation firm based in Santa Ana, California. Established in 1984, Callahan & Blaine specializes in complex litigation of all types, including catastrophic personal injury, insurance bad faith and complex business litigation. The highest personal injury settlement in United States history, $50 Million. The fourth highest personal injury settlement in United States history, $28 Million. The highest class action settlement in Orange County history, $38 Million. In addition, Callahan & Blaine is frequently hired by large corporations to handle complex business litigation matters on the defense, especially for complex matters which require expert litigation and trial skills. In fact, Callahan recently obtained a 12-0 defense verdict after a two month jury trial for one of the largest technology companies in the world for a very high stakes litigation matter. In November of 2008, Dan obtained a $38 Million settlement in the Gonzalez v. Freedom case. This settlement is the largest employment law settlement in Orange County history. In November of 2007, Dan obtained a $50 Million settlement in the Daniel v. City of Dana Point case. This settlement was certified by West Trial Digest as the largest personal injury settlement for one case in United States history. In 2003, Dan obtained a $28 Million settlement in the Dohrman v. Allied personal injury case. This settlement was certified by West Trial Digest as the fourth largest personal injury settlement for one case in United States history. In 2003, after a three month jury trial, Dan obtained the largest jury verdict in Orange County history, a $934 Million jury verdict in the Beckman Coulter v. Flextronics case. In 1993, Dan obtained a $58 Million judgment against Farmers Insurance Company for insurance bad faith. Dan was named one of the Top 10 Attorneys in the United States by the National Law Journal in 2004. Dan was named a California Lawyer of The Year by California Lawyer magazine in 2003. Dan has been featured in Best Lawyers of America for 2005, 2006, 2007, 2008, 2009 and 2010. Dan was named Business Litigation Trial Attorney of the Year by the OCTLA in 2000 and 2004. Dan is a frequent speaker and author. He has given hundreds of seminars and speeches and written over 25 articles on numerous trial and litigation topics. 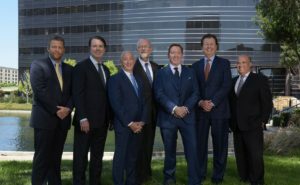 Dan is featured in Super Lawyers, Outstanding Lawyers of America, Pre-Eminent Lawyers of America and many other publications as one of the premier trial attorneys in the United States. Dan has been named as one of the Top 50 Super Lawyers in Orange County since 2006. Callahan & Blaine also features numerous other highly successful trial attorneys, including Edward Susolik. Ed, who is head of Callahan & Blaine’s Insurance Department, specializes in complex business litigation, severe personal injury and the resolution of complex insurance disputes. He has been responsible for many multi-million dollar verdicts and settlements over the years. Ed has handled over 1000 bad faith lawsuits and disputes and has recovered over $750 million in insurance proceeds on behalf of his clients over the years. Ed is a frequent speaker on insurance and litigation issues to lawyers, business groups and others. Ed is a member of the adjunct faculty at USC Law School, where he has teaches Insurance Law and Personal Injury law.